Home Scandal and Gossip Kate Spade marital problems: Kate Spade husband wanted divorce. Kate Spade marital problems: Kate Spade husband wanted divorce. Pictured NYC fashion designer and husband, Andy Spade. Screen shot. Pictured NYC fashion designer and husband, Andy Spade who spoke of challenges with their new fashion line, Frances Valentine. Screen shot. Kate Spade marital problems: Kate Spade husband, Andy Spade was demanding divorce. How the strain of new label ‘Frances Valentine’ caused the couple’s long term relationship to implode. 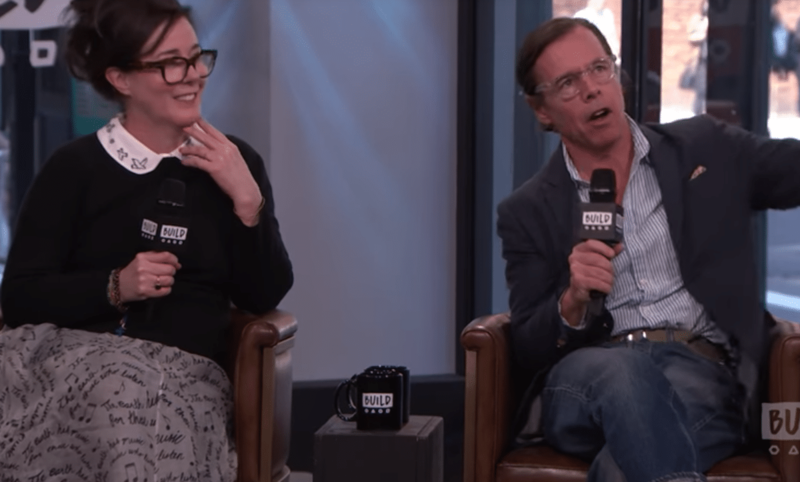 New revelations have alluded of marital discord between Kate Spade and her husband Andy Spade as the likely catalyst of the NYC fashioner designer’s suicide death. In recent days, Andy had sought divorce, demanding an end to the couple’s 24 year marriage, having been together for 30 years while a depressed Kate pleaded with her husband to stay. Come Tuesday morning, circa 10.10 am, Spade’s housekeeper discovered the designer unconscious and unresponsive, with Spade declared at the scene. Cause of death was determined to be by hanging, after Spade tied a scarf to a doorknob. Sources revealed Andrew Spade, being at the couple’s Park Avenue home ( 850 Park Ave) when the suicide was discovered, with their 13 year old daughter, Frances Beatrix Spade at school. No criminality was suspected, NYPD Chief of Detectives Dermot Shea said at an unrelated press conference. According to US magazine, sources told the gossip outlet the long term married couple, both aged 55, had been experiencing marital problems and had recently separated with Andy already looking for a new residence. Andy was looking to purchase a new apartment in New York City due to marital problems, according to The Blast, which also reported that Andy was shopping for a new one or two-bedroom apartment in Manhattan. Another source told of the couple continuing to work together on the recently newly launched fashion line, Frances Valentine with their own finances. Nevertheless there had been difficulties with the brand’s creative direction and finances. Did new Frances Valentine fashion label inspire separation and marital breakdown? ‘OK, that is such a joke,’ Kate responded, laughing. ‘This is the beauty of being together 30 years,’ added Andy, who is the brother of actor David Spade. Spade’s suicide was ‘not unexpected’ according to her family who say she struggled for years with bipolar disorder – but was too scared to seek help in case it hurt her brand. Her older sister Reta Saffo said Spade struggled to cope with her celebrity status, which only made her suspected bipolar disorder worse. She added that her sister had been planning to kill herself for a long time before she hanged herself on Tuesday. Saffo said the 55-year-old never anticipated how successful her brand would become – and how she, with it, would become a household name. What Spade was also unprepared for was the ensuing tension that her new ‘Frances Valentine’ line would cause as Andy and Kate struggled to get the line widely accepted, particularly in light of previous success and the lack of the corporate juggernaut which long took over the Kate Spade name and line- with the designer seeking a come back but under her own terms. By 2006, the Kate Spade line was valued at $125 million, with Kate leaving for good the following year after Neiman sold Kate Spade & Co to Liz Claiborne that same year. Come 2017, fashion behemoth, Coach paid an astonishing $2.4 billion to acquire the Kate Spade line from Clairborne. Sums of money that the Spades had long forfeited. In the interim, the recently launched Frances Valentine line continued to languish. The couple married in 1994, one year after launching Kate Spade New York together. Tellingly a suicide note found also pointed to family discord. Frances Valentine a new identity to cover old wounds? Frances Valentine was a new attempt at designing under her own name having long relinquished her name, identity and even legally changing her name to Katherine Noel Frances Valentine Brosnahan. According to TMZ, ‘She and Andy met while attending Arizona State University and working at a clothing store. Together, they launched Kate Spade Handbags in 1993,’ and the company soon expanded into other areas, like stationary and eyewear. Eventually, it became a fashion powerhouse and Kate’s name became well-known. Page Six reported that Kate Spade was agonized in the end over relationship problems, but wasn’t more specific. Trying to buy a Frances Valentine wallet to mark this day. The site wont load because many other people clearly had the same idea. Which is beautiful and devastating all at the same time. Kate and Andy spade sold their business to Neumann Marcus In 2007 but NM sold it to tapestry later. She started a new business called Francis valentine and changed her name to Katherine Noel Frances Valentine Brosnahan Spade. Strange? I loved Kate Spade, may she rest in peace. She no longer owned her name, though. She was designing under Frances Valentine. Kate Spade was so talented, I’m really shocked. Her new brand ‘Frances Valentine’ is one of my favorites. So much talent, you’d think she had it all. But nothing is more powerful than the state of your mental health. I’m so sorry Kate didn’t feel she could carry on. So sad.